No White Christmas For SE NM This Year. 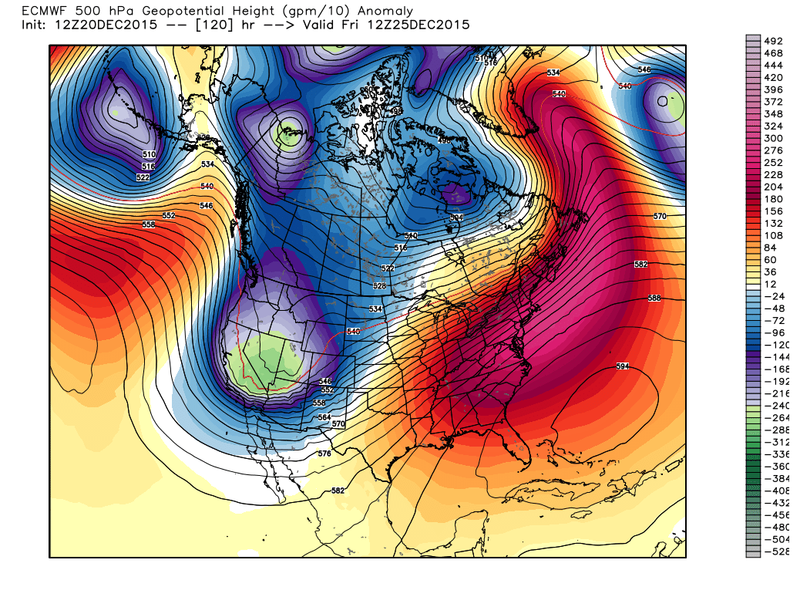 This Mornings 12Z/5 AM MST European (ECMWF) 500 MB Forecast. Valid @ 5 AM MST Christmas Morning. 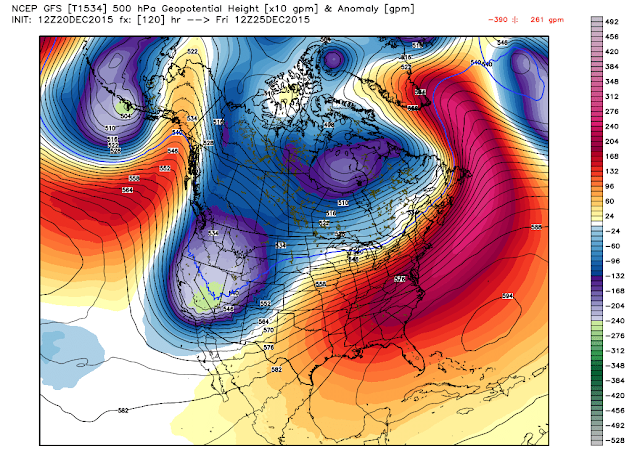 This Mornings 12Z/5 AM MST U.S. GFS 500 MB Forecast. 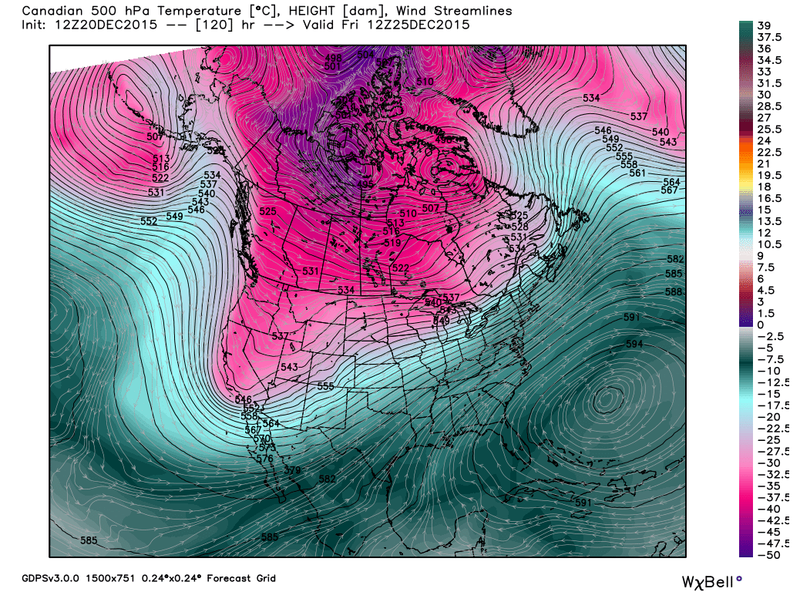 This Mornings 12Z/5 AM MST Canadian (GEM) 500 MB Forecast. I'll go ahead and play the role of Mr. Scrooge and ruin your expectations of a white Christmas this year if you live in southeastern New Mexico and nearby areas. Not this year folks. Sorry. At least this is the way it looks now. 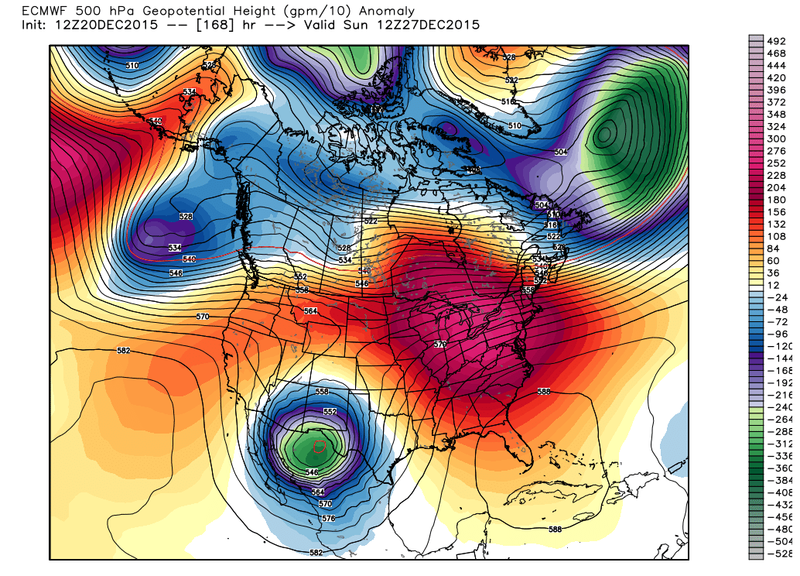 A powerful winter storm is forecast by the models to be approaching the central California area by Christmas morning. Unless this storm really speeds up and dives way further south than current model forecasts indicate we are not going to have a white Christmas locally. Current model forecast trends are calling for a warm and dry Christmas Eve and Christmas for us. Our high temperatures will be in the mid 60's to near 70 Christmas Eve. 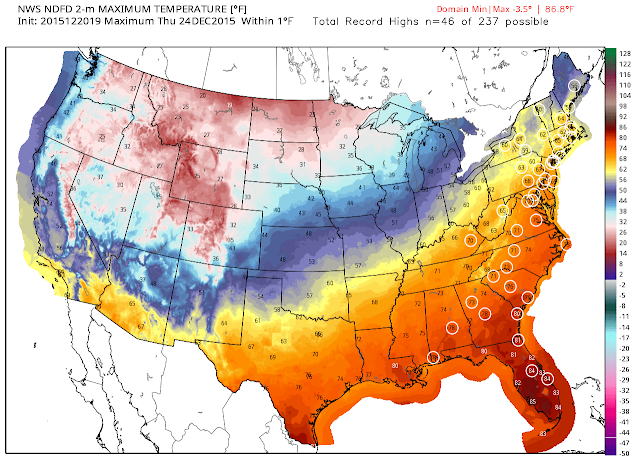 And from the upper 60's to the low 70's on Christmas. These temperatures will be some 10-20 degrees above normal. Warm & Dry For Christmas This Year. 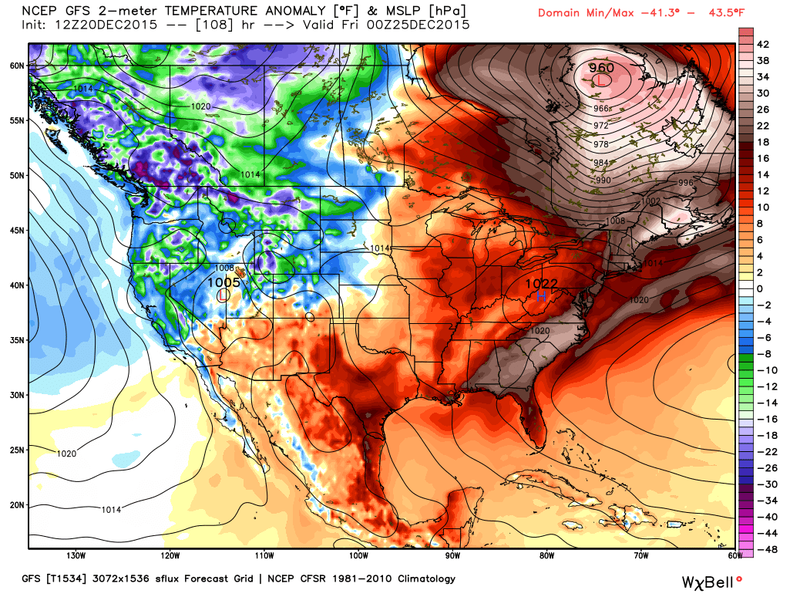 This Mornings 12Z/5 AM MST U.S. GFS Temperature Anomaly Forecast. Valid @ 5 PM MST Christmas Eve Afternoon. 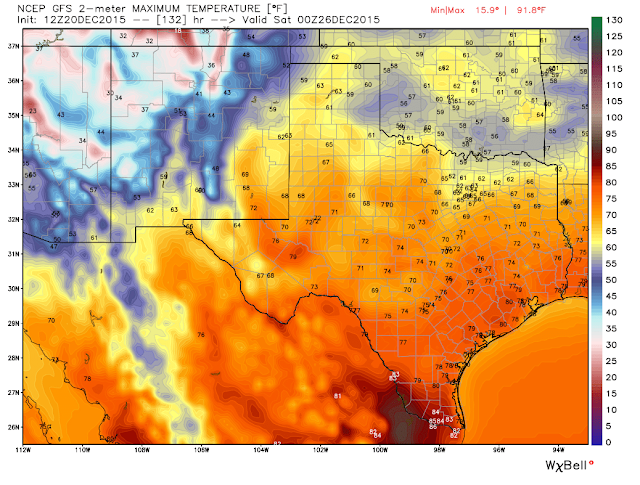 This Afternoons NWS NDFD Maximum Temperature Forecast. 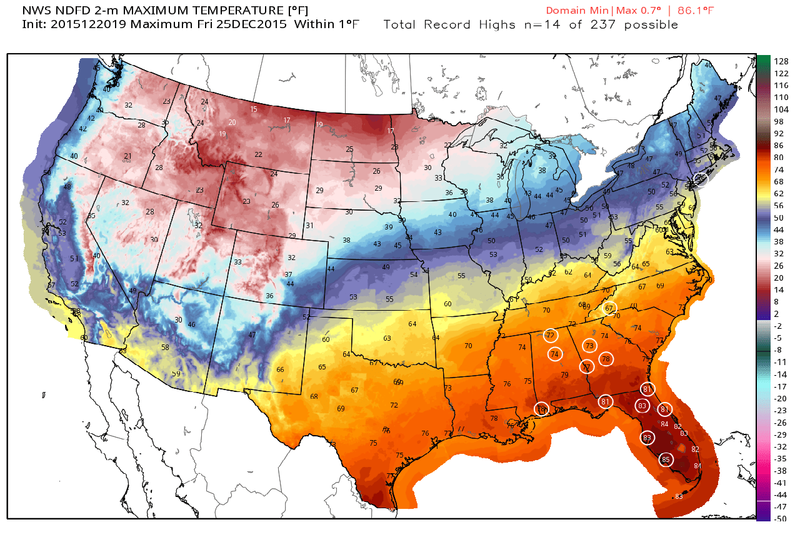 The cities that have circles around them may tie or break their record high temperatures for the day. This Mornings 12Z/5 AM MST U.S. GFS High Temperature Forecast. 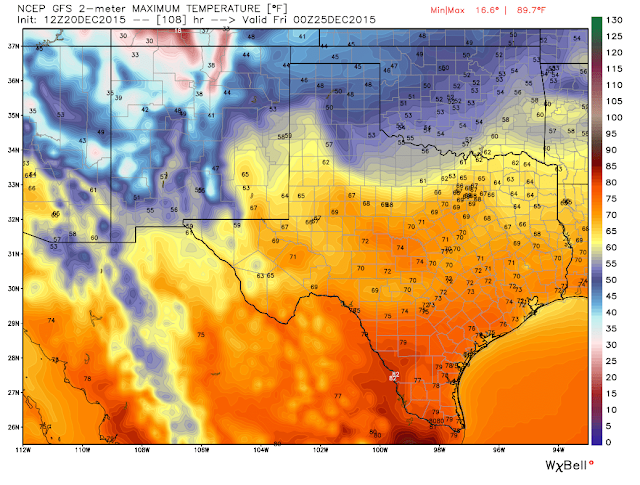 Valid @ 5 PM MST Christmas Afternoon. Model Mayhem & Chaos For The End Of The Week. To be truthful I'm not sure the computer forecast models know what to do with our next winter storm late next week. They continue to be all over the place with their forecasts. So to say the least a great deal of uncertainty remains surrounding this event, which is due to start impacting New Mexico by the end of this upcoming week. 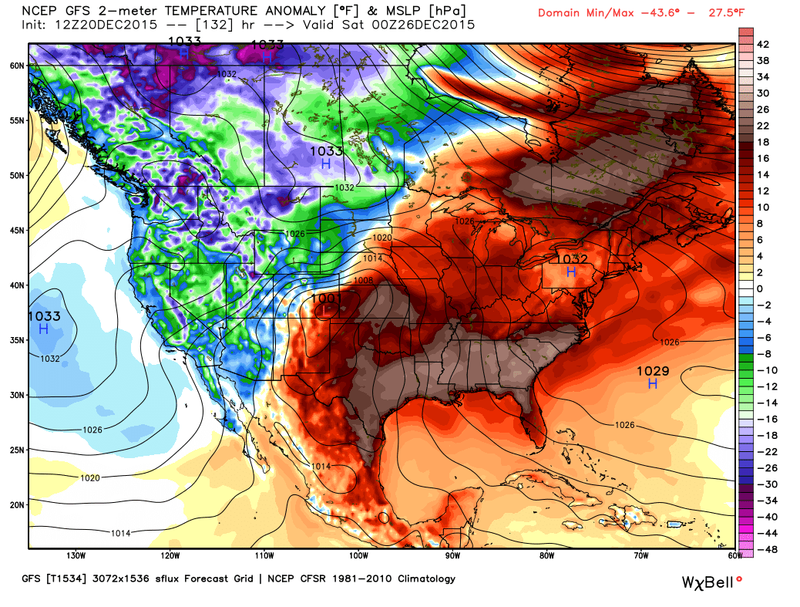 This mornings U.S. GFS model has backed off on its snowfall forecast for the southeastern plains. In stark and almost ridiculous contrast this mornings European model drops a "meteorological bomb/closed mid level low" south of El Paso by next Sunday morning. Its snowfall forecasts for southeastern New Mexico borders on the absurd. Using the 15 to 1 snowfall ratios, generally speaking, it clobbers the southeastern plains east of the Sacramento mountains with two to nearly three feet of snow. Thanks just really hard to believe! Its fairly safe to say that for now nothing is clear yet concerning our weather from Christmas onward into the holiday weekend. Yes there will be a winter storm headed to the Four Corners area but what impacts, where, and how long are still up in the air. If you have travel plans anywhere in the New Mexico, Arizona, Texas, Colorado, and nearby areas from Christmas into next weekend please keep up to date with all of the latest National Weather Service forecasts, watches, and warnings concerning this potential significant upcoming winter storm. Listed below are some great resources to use. Nationwide National Weather Service Watches/Warnings/Forecasts. (Click Anywhere On The Map Of Your Interested Area). Midland NWS Office Web Page. El Paso NWS Office Web Page. Amarillo NWS Office Web Page. Lubbock NWS Office Web Page. Flagstaff NWS Office Web Page. Albuquerque NWS Office Web Page.